Our organization offers a wide range of Rotary Cutting Machines acknowledged for precision functioning and long functional life. The machines are provided with double edge, which helps to cut the desired profile in an effective manner. We offer these machines at industry leading prices. Having large years of expertise and skills in domain, we are offering a wide array of Rotary Cutting Machine. This Rotary Cutting Machine is provided by us as per the needs of the customers. Our offered Rotary Cutting Machine is sharp and used for cutting paper, fabric and many more. Capacity: Ranging from 800mm to 1500mm wide . Being a leading firm in this industry, we are deeply engaged in offering a high-quality range of Rotary Biscuit Cutting Machine. Rotary cutting machine forms the shape of the biscuit out of the dough sheet coming from the gauge roll unit. The sharp edges of the cutting roller cuts the dough sheet into the desired shape of the biscuits and delivers the same to the oven through a panner web. 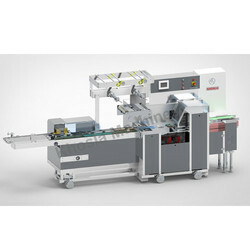 Biscuit Cutting Machine is utilised for continuous production of different variety of Hard Dough & Fermented Dough biscuits. It consists of two or three sets of Chilled Cast Iron gauge Rolls, Cutting Web, Rotary Cutter and Panner Web Conveyor as well as a Scrap Return Conveyor. The single head rotary cutter prints fine design on a continuously fed dough sheet and also cuts out the individual dough piece. 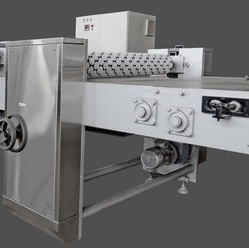 Rotary cutting machine forms the shape of the biscuit out of the dough sheet coming from the gauge roll unit and delivers the same to the oven through a panner web.